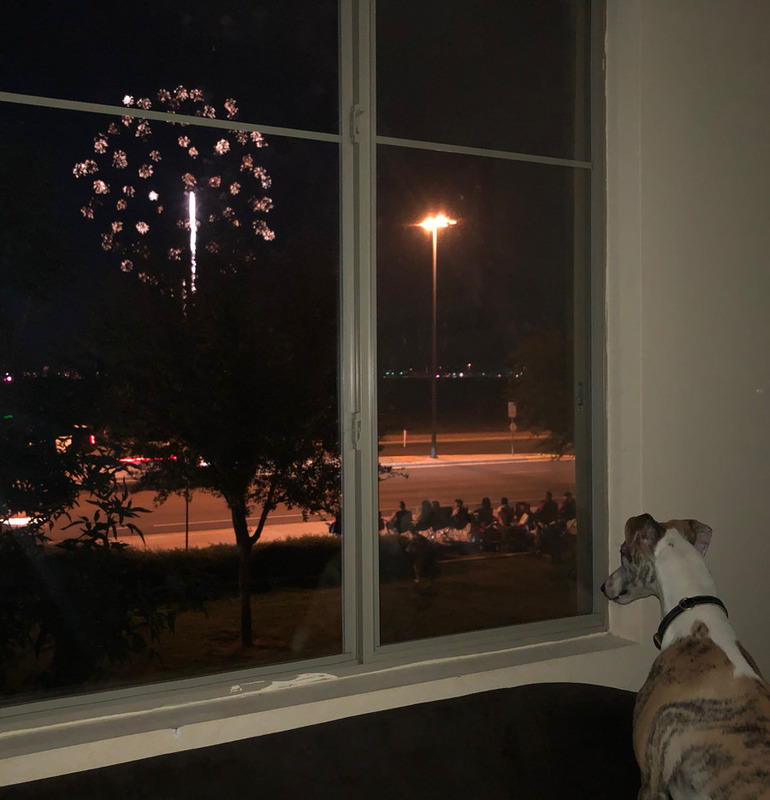 Thought I would ask, how did it go last night with the fireworks? Poor Gibson had about an hour of trembling next to me. It has not been a favorite holiday for us to keep our dogs calm. I have used loud music and it helps. My neighbors were kind and stopped about 10 for most of it. We have enough storms in Florida to make our dogs hide or panic. Our greyhound goes in the closet. It's much worse if not here with them. I live on a lake where the 4th of July fireworks (illegal) rival that put on by most small towns. It is truly splendid. My girl has developed problems with fireworks as she has aged, so we pack up and go to a quiet motel for the night. The few random blasts as we packed up were enough to have her panting and apprehensive. There is no reason we can't go to quiet fireworks as they are doing in Europe, as that is better for those with PTSD, wildlife, babies, as well as our pets. I live right across from a field where the city shoots them off (suburb of Phoenix, AZ), and I was all ready with Molly's thundershirt and meds but I was surprised at how well she did. She acted a little concerned at first but then just wanted to be held and cautiously watch. I'm sure having Zeke there made all the difference, he's super eager and curious about everything so he was stoked that something new and exciting was happening... weird pupper. It's been a tough few days here, although we missed the worst of it since we went off to spend a couple of days with the dogs at a nice quiet campground. For years we haven't worried about this - our first Whippet was incredibly sound-phobic, even a car backfire was enough to make him tremble for a really long time, and we lived in the city at that time, but since he's been gone no one had been bothered - then suddenly, for who knows what reason, our young ones, who are about to turn 3, started reacting terribly to loud noises about a month ago (and we're now out in the country where folks hunt and target shoot and stuff like that ). Never tried the Thundershirt, and have also been hearing good things about BlackWing Farms products (given up on Rescue Remedy), as well as hemp and CBD oils - some things we may try. I hope the 4th is not a big deal each year. The storms are another thing that happen much more and can't plan for. I was walking Gibson out on the street sidewalk and had a loud thunder crack and he panicked at the end of the leash trying to get away. He almost pulled his collar off. I picked him up to get him to calm down. A fireworks boom had him jump and run trying to pee in the fenced yard. That could have caused him to take off but he did run to the door. It does not seem to have left any effect yet but time will tell how he acts next time. There is a category for dog calming products on pet sites. Thundershirt has more products that spray or a collar for dogs. Anyone here use or recommend something for whippets? I have never used any but just comfort the dog. It is also for separation but fortunately we don't have to leave him alone. I am using the ex-pen more as it goes locking him with toys and chew treats. Maybe we can start leaving for short trips out.